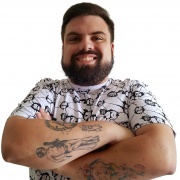 André Coelho is an Agile Chapter Manager at Concrete, a company recognized for its deep knowledge and applicability of Agile methodologies in Brazil. He's also a Professional Scrum Trainer for Scrum.org. André Coelho started working as a developer in 2005 and had his first contact with Scrum in 2007. Since then he worked within a variety of business ranging from big government companies to small startups and advertising companies. This experience mix helped him to evolve his empathy skills and have a broader view of the market.